How Can You Avoid Colds and Flu? Steps you can take to avoid this year’s flu; facts about flu shots; natural remedies to minimize the effects of the common cold; and what to do if a flu or cold hits you hard. ACHOOO! Uh oh. You may be catching something. Is it the flu? Or just a cold? Whether it’s a cold or flu, you know either can wipe you out and make you feel miserable. What can you do to prevent them? And if you do get catch a cold or the flu, what’s the best treatment? Introducing a new FREE downloadable guide: Cold & Flu Prevention: Common-sense remedies for preventing, fighting off, and treating the common cold and flu. Written by the editors of University Health News, Cold & Flu Prevention will prepare you for the coming flu season. Use our experts’ science-backed information to stay healthy all winter long. Flu season begins in October and runs until late spring. While the severity of each flu season varies, the steps you can take to prevent the flu are the same. Don’t miss the easy-to-follow advice to keep you healthy and active in Cold & Flu Prevention. Food is the fuel your body needs to keep its organs and systems working properly. Inadequate calorie and nutrient intake is associated with a weaker immune system. Keep foods high in zinc, selenium, and vitamins A, C, and E on your menu during flu season. Find out which foods are your best sources of these disease-fighting nutrients in your FREE copy of Cold & Flu Prevention. What about vitamin, mineral, probiotic, and herbal supplements? University Health News’ Cold & Flu Prevention gives you the straight facts on what works and what doesn’t. In short, for flu prevention our advice is to get your required nutrients from complete meals. Popping pills is simply a waste of money. And sometimes dangerous to your health. Your immune system also benefits from proper sleep and regular exercise. Getting a good night’s sleep not only recharges your brain and body but also allows your immune system to produce important virus- and disease-fighters. And with the onset of cold weather, it’s important to maintain strong exercise habits to combat colds and flu. 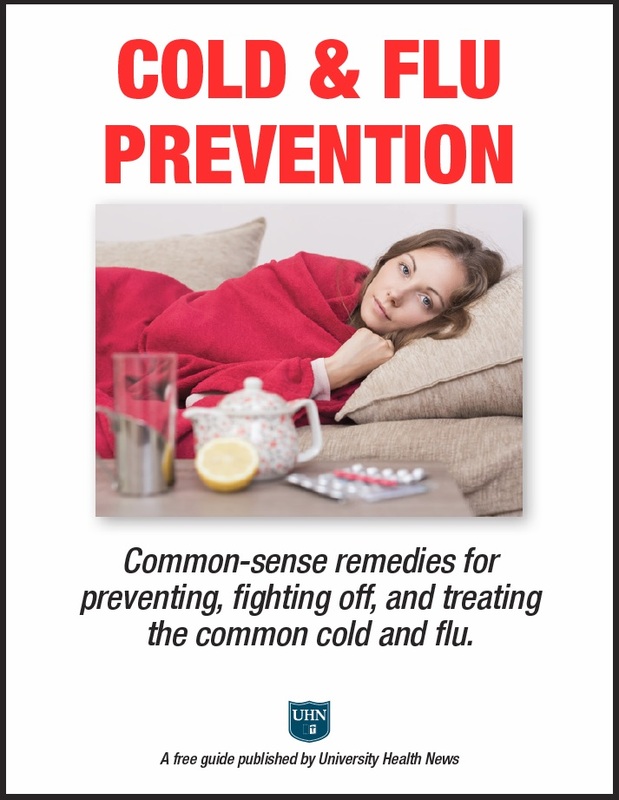 For more details, download your free copy of Cold & Flu Prevention. Can hand washing really help prevent colds and flu? Myth or fact? Is regular hand washing a path to cold and flu prevention? Experts believe that the single most effective action you can take to prevent colds and flu is to wash your hands. While you probably know that hand washing is important, you may not know how to wash your hands properly to reduce your risks. Cold & Flu Prevention is your guide to the healthy habits you need to protect yourself. It’s not only your hands that need attention but everything you and your family touches. Food prep; bathroom use; handling of phones and TV remotes; kids’ toys; doors and cupboards; and more! Learn where viruses are lurking and how best to defeat them. Flu vaccines continue to cause confusion. How effective are flu shots? When should I get my flu shot? Will the flu vaccine itself give me the flu? Can I get a flu shot if I’m allergic to eggs? Do mercury-free flu vaccines exist? Am I too old to get a flu shot? Does this year’s flu vaccine protect me against both influenza A and influenza B? Cold & Flu Prevention gives you all the facts and the options available to you so you’ll be best protected from the flu. Get your questions answered and concerns addressed in this free guide. And then, go get a flu shot! What happens if you get the flu? Or contract a cold? Is there anything you can do to feel better faster? Cold & Flu Prevention is filled with advice to get you up and about and back to feeling yourself. You’ll read about the wide-range of over-the-counter options available from modern medicine that can help relieve cold and flu symptoms. The free guide also shares the most effective natural strategies to get you back on your feet. The benefits of many old-school remedies are reviewed, from hot beverages and broth to salt-water gargles and saline nasal rinses. If you feel like you’ve been hit by a truck, you won’t want to miss any of this easy-to-follow advice. In the war on colds and flu, there is no silver bullet. The best advice for avoiding the flu and colds is to practice the wide-range of healthy habits outlined in University Health News’ free guide Cold & Flu Prevention. Learn how to attack the virus with a strong defense. Build your immune system through diet, exercise, sleep, daily practices, and of course a flu shot. Let Cold & Flu Prevention be your guide to a healthy season. Great to have this information in one place. Thank You ! I thought you might be interested in this article on https://universityhealthnews.com: Cold & Flu Prevention: Common-sense remedies for preventing, fighting off, and treating the common cold and flu.